Ayushmann Khurrana sings Beautiful Ballad ‘Nain Na Jodeen’ for Badhaai Ho! After delivering blockbuster songs like ‘Pani Da Rang’ (Vicky Donor), ‘Sadi Gali Aaja’ (Nautanki Saala) , ‘O Heeriye’ (Single) and ‘Mitti Di Khushboo’ among others, singer- actor Ayushmann Khurrana teams up with music director Rochak Kohli for a special song from Badhaai Ho, titled ‘Nain Na Jodeen’. 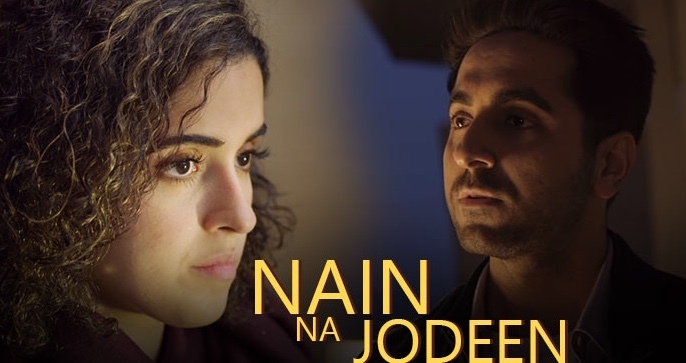 The two have composed many memorable songs in the past and this one promises to have a lasting impression on listeners – Sung by Ayushmann and Neha Kakkar, with lyrics by Kumaar, ‘Nain Na Jodeen’ is an emotional song of love and separation. After ‘Badhaaiyan Tenu’ and ‘Morni’, the makers now launch the soft ballad that establishes the bond shared between Ayushmann and Sanya’s characters in the film. Badhaai Ho also starring Sanya Malhotra, Gajraj Rao, and Neena Gupta releases 19th October 2018. Junglee Pictures presents Badhaai Ho in association with Chrome Pictures. Produced by Vineet Jain, Aleya Sen, Hemant Bhandari and Amit Ravindernath Sharma, the film is co-produced by Priti Shahani. 16 queries in 0.642 seconds.